*** Per the comment below, and the Samba Grill website; Samba Grill has closed. I'm sure this post will quell all those who are seriously concerned about our red-meat intake. 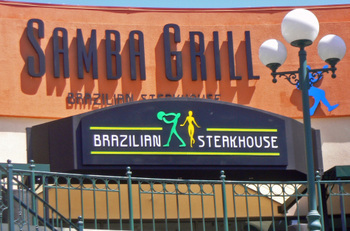 Samba Grill is a new Brazilian Steakhouse, or Churrascaria, the crowning jewel residing on the top floor of Horton Plaza Shopping Center in downtown San Diego. If I remember correctly, this used to be FAO Schwartz. The Missus and I have fond memories of meals at Greenfields, Fogo De Chao, and Roda Viva in Los Angeles, but were a bit disappointed at the protein provided at Rei Do Gado, though we enjoy the salad bar and hot table items. To us, $35 per person is just too much to pay, for a good salad bar, and rodizio items that vary widely in taste and quality. What we decided to do at Samba Grill, was to grab lunch there, which is priced at a very reasonable $13.99($11 - salad bar only). This would help us determine if dishing out $35 for dinner would be worthwhile. 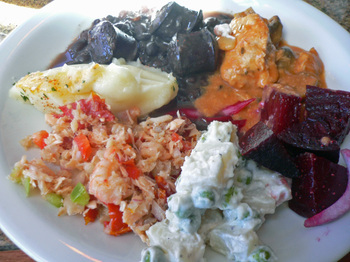 As with most Rodizio style buffets, there is a "red-green" item located on each table. 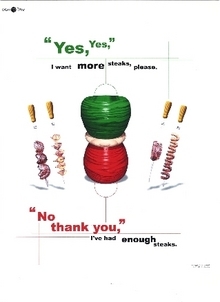 Green means "bring on the meat", red means "no mais". If you've never experienced a Rodizio style meal, I'd recommend trying it at least once. It's a fun way to eat, and if done right, is a great way to pace yourself while getting your meat "fix". Most of the items were very mediocre, and not even close to Rei Do Gado in flavor. The selection was rather small as well. But let's stay positive; I love fresh beets, and could eat them plain, with just a squeeze of citrus. So needless to say, I truly enjoyed the beets flavored with a nice vinaigrette. The "Feijoada", the beans and meat dish(in this case only sausage), though very simple, was the other hot table item that stood out. Other then that, and a well seasoned potato salad, the parade of flavorless mashed potatoes, pesto pasta salad, and other items were very uninspired. And no hearts of palm...bummer! But of course, the meat-fest was just beginning. So for the uninitiated, think of a Rodzio as a reverse buffet. You sit, and the protein comes to you, courtesy of Servers carrying meat skewers, carving them right at your table. 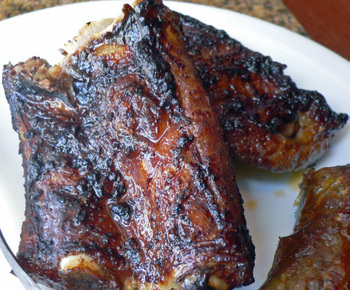 The meats at Samba Grill run the gamut. From the fairly good - bacon wrapped turkey, pork ribs, and a very well seasoned, though dry Pork Tenderloin. Then there was the plain bad, such as the tough and dry sirloin caps. As you can tell; most all the meats are served well done. This creates quite a challenge for tougher cuts. 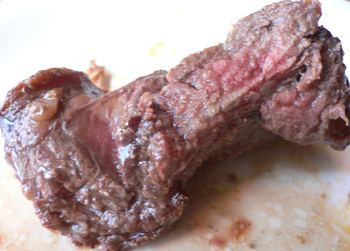 And one really heinous, old and metallic flavored dish; the skirt steak. I seldom ever have a piece of meat I can't swallow. But this was one of them. 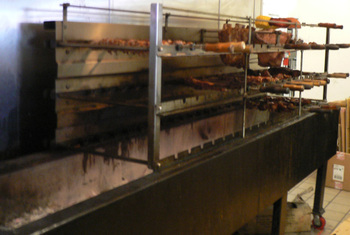 We came to understand the cuts at Samba Grill, anything Sirloin was dead dry, as were many of the meat items. 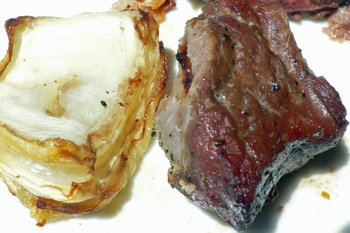 For example, the best part of the Filet Mignon were the onions. He had a demeanor, that I'll call "warmly professional, and genuine". Once he found out we were really interested in what we were eating, he described each item in detail. By the end of the meal, we had developed a very nice rapport with Him. Once we had finished, and turned our dial to red; He came up to our table and said "Sorry, but I didn't see the sign. This just came off the grill, and it is good as you'll get. So I'll have to pretend I can't see!" And proceeded to place a piece of perfect, sizzling, bacon wrapped turkey on our plates. And He was right, the best item of the day. I would suggest that you try Samba Grill, but for lunch first. From what I understand, there are only 2-3 more meat items served for dinner(lamb and chicken hearts among them). If I were to make a comparison between Rei Do Gado, which is right across the street and Samba Grill, it would be even on the meat; but Rei Do Gado has it all over Samba Grill with regards to the Salad Bar and hot table items. 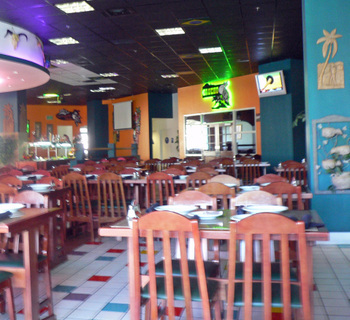 But, I've had some very lousy service at Rei Do Gado, while the service at Samba Grill was very warm and friendly. I will say that the charcoal spit roasting technique that Churrascarias use is probably more healthy than the pan-fried, crowned in butter style. Though having most everything well done is not showing the beef at it's best. Some notes: Remember you'll get 4 hours of Horton Plaza parking validation when dining at Samba Grill. 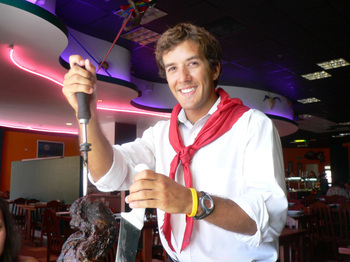 I also understand that Samba Grill is the San Diego extension of the Samba Grill in Salt Lake City, Utah. 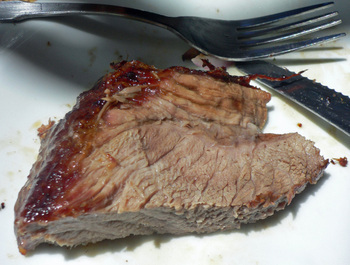 If you've never been to a Rodizio style Churrascaria, I'd encourage a visit. For those carnivores out there.....Rei Do Gado is a virtual meat fest. Located in the Gaslamp, this churrascaria (Brazilian steakhouse) serves up a buffet "rodizio" style - think of it as a reverse buffet. 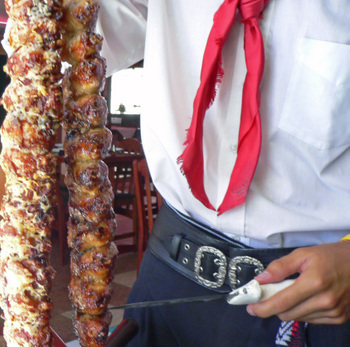 That is the server(s) comes up to your table with a particular meat offering on a skewer and asks you if you'd like that particular item, after which he'll slice or remove it from the skewer onto your plate. When you arrive at your table you first go and grab a plate and start with the first course, a very well appointed salad bar and fill up - but not too much, you don't want to miss the upcoming meat-fest! The salad bar has such items as hearts of palm, stuffed sun dried tomatoes, a kim chee salad (delici-yoso), marinated mushrooms, among many others. There are two types of soup (sorry too busy with the salad), and a buffet of various hot foods and starches including fried yucca, white rice, and mashed potatoes. From my seat I could watch all the meat being prepared through a glass window. The cook was constantly moving skewers around or shifting around the charcoal under the meats. 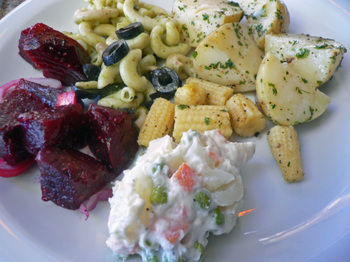 Among the hits; everyone loved the sun dried tomatoes, and I enjoyed the hearts of palm and the kim chee salad. The cheese covered chicken legs, bacon wrapped turkey and filet, and the tri-tip were tasty. 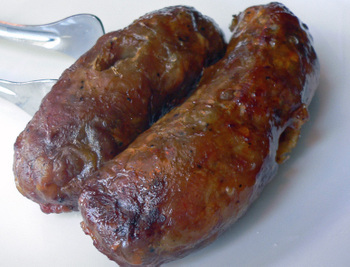 The "baby-back"(looked like spareribs) ribs were very flavorful, but hardly had any meat, the pork loin was ok with just a hint of cumin, the home made garlic sausage was a dismal failure, there was heat, but no other taste, and the sausage was dry to the point of crumbling. The food today was much better than on my last two trips here, so things are looking up. Today we were seated in the "new" area of the restaurant, seems that Rei Do Gado is doing so well that they've taken over restaurant space next door! So two salad bars, two "cooking booths", and more space, so business must be doing well. So how does Rei Do Gado stand up against other Churrascaria's I've been too? 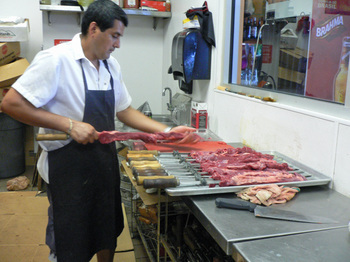 The flavoring and variety of cuts are below that of Roda Viva in City of Industry and Greenfields in West Covina. 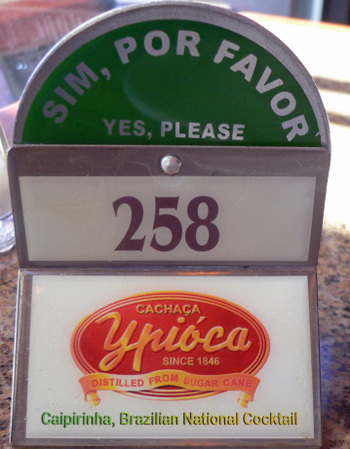 It is however, a great place to visit if you've never experienced a Churrascaria, or for taking visitors. I usually take visiting friends from Hawaii there. Or if you need a serious Atkin's diet boost, this sure is the place to get it!